The Atacama Trench, also known as the Peru–Chile Trench, lies in the eastern Pacific Ocean, about 160 km off the coast of Peru and Chile. It reaches a maximum depth of 8,065 m below sea level in Richards Deep (23°10’S, 71°18’W) and about 5,900 km long and its mean width is 64 km and it covers an expanse of some 590,000 km². It is a deep arcuate trench in the South Atlantic Ocean lying 100 km to the east of the South Sandwich Islands. The trench is created by the subduction of the southernmost portion of the South American Plate beneath the small South Sandwich Plate. It is the deepest trench of the Southern Atlantic Ocean. The trench is 965 km long and has a maximum depth of 8,428 m below sea level in Meteor Deep (55°40’S, 025°55’W). It is 122 km northeast of Zavodovski Island. The Trench is located on the boundary between the Caribbean Sea and the Atlantic Ocean. The trench is 800 km (497 mi) long and has a maximum depth of 8,648 m (28,373 ft) at Milwaukee Deep (19°35′N 66°30′W), which is the deepest point in the Atlantic Ocean. 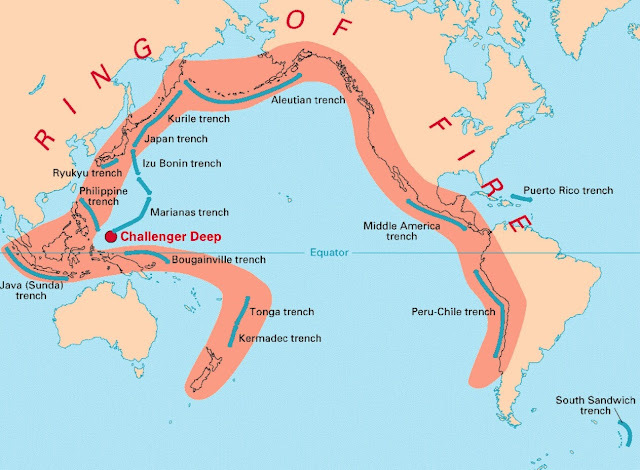 The Japan Trench is a part of the Pacific Ring of Fire, in the floor of the northern Pacific Ocean off northeast Japan. It extends from the Kuril Islands to the Bonin Islands and has maximum depth of 9,504 m (31,181 ft) at Tuscarora Deep (44°55'N 152°26'E). The trench believed created when the oceanic pacific plate subducts beneath the continental Okhotsk Plate. Continuing movement on the subduction zone associated with the Japan Trench is one of the main causes of tsunamis and earthquakes in northern Japan. Izu-Bonin Trench or Izu-Ogasawara Trench is an oceanic trench in the western Pacific Ocean, consisting of the Izu Trench at North and the Bonin Trench at South. It has depth of 9,780 m (32,087 ft) at 29°65'N, 142°68'E. The Izu-Ogasawara Trench is an extension of the Japan Trench. Here, the Pacific Plate is being subducted beneath the Philippine Sea Plate, creating the Izu Islands and Bonin Islands on the Izu-Bonin-Mariana Arc system. The Kermadec Trench is a submarine trench in the floor of the South Pacific Ocean. It is created by the subduction of the Pacific plate under the Indo-Australian Plate, with thousands of kilometer parallel with the island arc and it noted for its very abrupt slope. The Kermadec Trench reaches a maximum depth of 10,047 m(32,962 ft). Kuril-Kamchatka Trench, also known as Kuril Trench, a narrow, deep depression in the Pacific Ocean along the eastern underwater slopes of the Kuril Islands and the southern part of the Kamchatka Peninsula. Extending for about 1,800 miles (2,900 km) north-south, it has a maximum depth of 10,542 m(34,587 ft) at Vitiaz’ Deep and covers a total area of 264,000 km². The Philippine Trench is a submarine trench to the east of the Philippines. It has a length of approximately 1,320 km (820 mi) and a width of about 30 km (19 mi) from the centre of the Philippine island of Luzon trending southeast to the northern Maluku island of Halmahera in Indonesia. Its deepest point, the Galathea Depth, has a depth of 10,540 m (34,580 ft). The Tonga Trench is an oceanic trench located in the South Pacific Ocean. The trench lies at the northern end of the Kermadec Tonga Subduction Zone. It is 10,882 m (35,702 ft) deep at its deepest point, known as the Horizon Deep (23°15.5′S 174°43.6′W). The Mariana Trench or Marianas Trench is the deepest part of the world's oceans. It is located in the western Pacific Ocean, to the east of the Mariana Islands. The trench is about 2,550 km (1,580 mi) long with an average width of 69 km (43 mi). It reaches a maximum-known depth of 11,034 m (36,201 ft) at the Challenger Deep (11°22.4′N 142°35.5′E).